The most exciting two minutes in sports is only four days away and ticket prices are now at their lowest point. The 139th running of the Kentucky Derby will take place this Saturday at the historic Churchill Downs in Louisville. This year’s race figures to be relatively wide open with Verrazano and Orb currently leading the field. After an eventful month of April, University of Louisville basketball coach Rick Pitino hopes to expand his legend this weekend at the derby. With a stake in long shot Goldcents, Pitino can add a Kentucky Derby win to his 2013 NCAA Championship and 2013 Hall-of-Fame selection. 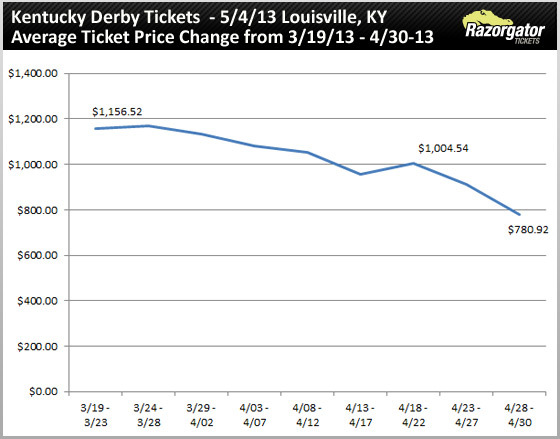 The average price for tickets is currently $758, down $139 or 15% since Friday. Over the past 2 weeks, the price drop has been much more dramatic. Since April 15, the average price has dropped 26% or $267. Infield general admission seats are now starting at just $46 with reserved grandstand seating starting at $218.